Wendy's plans to demolish their aging restaurant at 2006 Park Street. Once it's gone, a modern building featuring outdoor dining, lounge chairs, Wi-Fi, flat screen TVs and digital menuboards will rise in its place. Is it enough of an improvement to make Five Points a better pedestrian scale environment or should the design team head back to the drawing board? 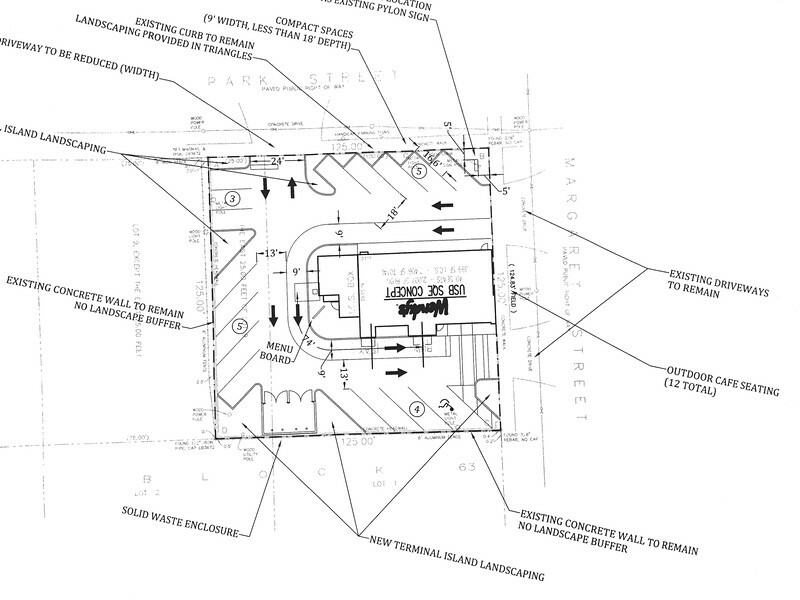 Five Points Wendy’s property owners, Frederick Hardy Bowen and Daniel Dwight Bowen of Mountain Lakes, NJ desire to rezone their 0.36-acre parcel from Commercial Community/General-1 (CCG-1) to Planned Unit Development (PUD), in order to redevelop the site. If successful, the 42-year-old fast food restaurant will be demolished and replaced with a modern 2,406-square-foot structure with 17 off-street parkign spaces. In addition, the existing parking lot will be redesigned to include areas for landscaping and greening of the property that currently does notexist. This video summarizes how the Wendy’s brand transformation is re-energizing all consumer touch-points. The design is a part of a national, multi-year strategy to reinvigorate the Ohio-based Quick Service Restaurant’s (QSR) brand, which includes remodeling remodel 85 percent of company owned units by 2017 and 35 percent of franchisee owned units. According to a recent article, Wendy’s CFO Todd Penegor stated that revamped restaurant locations on average have generated sales lifts of 10 percent to 20 percent. The plan proposed for Five Points would consist of 40 interior seats and 12 seats on a new outdoor patio facing Margaret Street. The new building’s design is intended to enhance the customer experience. Prominent features include a fireplace; a variety of inviting seating options, including lounge chairs and booths; Wi-Fi and flat-screen TVs; digital menuboards. Of special interest is how to best integrate the Wendy’s redevelopment plans into the ideology of enhancing walkability within Five Points. With this in mind, the Wendy’s redevelopment plan includes transforming an underutilized grass strip along Margaret Street into a 12-seat outdoor patio area directly in front of the new restaurant. The application is scheduled to be heard by the Planning Commission on November 17, 2016. In addition, Riverside Avondale Preservation (RAP) will be hosting a community meeting to discuss the Wendy’s redevelopment plan at 6 pm, November 10th at the Episcopal Church of the Good Shepherd.